Newtown Historic Association An important turning point in Newtown came in 1962 with the razing of “Washington’s Headquarters,” a historic brownstone house built in 1757 that stood on the southwest corner of Washington Avenue and Sycamore Street. George Washington used this house as his headquarters after the Battle of Trenton in 1776. Although it was not the exact same building that Washington used for his headquarters, it was rebuilt on the same foundation from much of the same material and was one of the most famous structures in Newtown. When the house was hastily demolished by developers one night, it inspired a chain of events that resulted in the formation of the Newtown Historic Association. Newtown Civic Association (1963) – A group of twenty citizens met at the home of A. Newton Gish, Jr., on January 24, 1963, to discuss planning and zoning for the Borough of Newtown. Concerns were expressed about development in Newtown and attempts to change zoning to permit building and development in the Borough, which was currently prohibited. There was much interest expressed in working toward preserving Newtown’s basic character and its historical heritage. Newtown Civic and Historic Association (1963) – The Newtown Civic Association name was disbanded and a new name was formed. The Newtown Civic and Historic Association was organized in May of 1963. Membership was open to all residents of Newtown Borough and Newtown Township. The purpose of the organization was to promote cooperative planning between the Borough and the Township; to study questions pertaining to planning, zoning, taxes, historical preservation, public health, recreation, safety and other matters of pertinent civic interest. Temporary Chairmen included Thomas Tewksbury, Ernest Millard, Helen F. Randle and William J. Doherty. Newtown Historic Association, Inc. (1964) – The issues identified by the Newtown Civic Association, coupled with the tragic demolition of Washington’s Headquarters, highlighted the need for establishing an official body to protect the historic heritage of Newtown. As a result, the Newtown Historic Association was officially incorporated in 1964 and gained a tangible presence when Mr. & Mrs. Robert L. La Rue donated the Half Moon Inn (Court Inn) building to serve as the association’s permanent headquarters. In a community so steeped in history, and with a deep appreciation for the wonderful architectural examples still surrounding its residents, it was inevitable that an active, concerned group of citizens would join together to work toward the preservation of this unique and historic heritage. There are three similar agencies in Newtown. We have provided the following page to help distinguish between them. 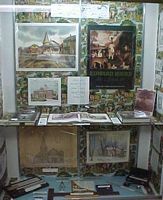 The Research Center & Barnsley Room of Newtown History is open to the public without charge on Tuesdays from 9:00 AM to 3:00 PM, Thursdays from 7:00 PM to 9:00 PM, and by appointment. Copying facilities are available. Research is also done by request. Download a copy of the Research Request Form. In April of 1867, a number of prominent residents of Newtown and Wrightstown Townships applied to the Commonwealth of Pennsylvania for, and were granted, a charter to establish a turnpike road from the Anchor Tavern in Wrightstown to Newtown. This became a reality in 1870, when the Newtown gate was erected at the intersection of Durham Road and Sycamore Street, on the site where the Goodnoe Dairy Bar once stood. A small frame house served as both the home of the gatekeeper and his family and the headquarters of the toll gate. Upon the payment of one cent, the gate was lifted and a pedestrian was allowed to pass through. Two cents opened the gate to a horse or ox. When automobiles came into use, the charge for a car and driver was five cents. In about 1920, the Toll House ceased to function and the building became a private residence until 1955, when it was moved farther west on Durham Turnpike, opposite the entrance to Eagle Road. When plans were being formulated for the Village at Newtown shopping center in the early 1980s, the Newtown Historic Association, along with other interested parties, persuaded the developer to preserve and restore the property. Built in two sections, the earlier part of the house dates from 1870. The color of the clapboard siding has been matched to the original paint color. The house features a bargeboard and an unusual window on the porch. The 5,000 acres originally comprising both Newtown Borough and Township were part of the vast tract purchased by William Penn from the Indians by William Markham, Penn’s agent, on July15, 1682. Penn originally called this area his “New Town” which eventually evolved into “Newtown”. Newtown was the county seat of Bucks County from 1726 to 1813 before it was moved to Doylestown. 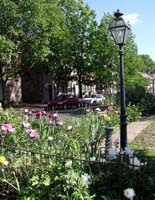 The town was patterned to resemble an open fan surrounding a narrow rectangular piece of property called the town common. The plan of the township and townstead were surveyed by Thomas Holme in 1684 and the boundaries that appear on his map of that date remain essentially the same today. Edward Hicks (1780-1849), son of Isaac and Catherine Hicks, the painter of the famous Peaceable Kingdom (Hicks painted over 100 different versions of this biblical scene), a leading American folk artist, lived in Newtown for almost forty years. Born in Langhorne, his mother died when he was only one year old and Hicks was raised in the Twining farm household in Newtown Township by David and Elizabeth Twining. 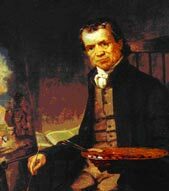 After an apprenticeship in Attleborough (Langhorne) and an eleven-year stint as junior partner of a coach maker in Milford (Hulmeville), Hicks moved to Newtown in the spring of 1811 with his wife Sarah Worstall and his children to go into business for himself. He moved into the house with the brick front on Court Street near Tucker’s Tavern (the Court Inn), which he had bought from Abraham Chapman. He soon opened a shop in his back yard and carried on his business of coach and sign painting. A few months after this move he became a Friends minister. A major local concern of Hicks was the establishment of a Friends Meeting in Newtown. Eventually the meetinghouse was built on Court Street on a two-acre lot bought from Dr. Phineas Jenks. 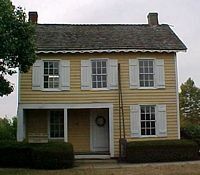 The first Preparative Meeting in the new house was held in 1817, at which Hicks was the first speaker. Through serving on Friends’ committees he became involved with the major social concerns of his day: peace, temperance, relations between the sexes, education, poverty and race relations. He sometimes worked as a janitor and grave digger. 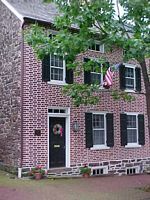 In 1821, Hicks built a stone house on present day Penn Street. He built his coach shop in the back yard, and his paint shop above the carriage house which adjoined his home. Neighborhood businessmen beat a path to the artist’s paint shop to order signs. The artist’s reputation spread state-wide. He resided in Newtown until his death in 1849 and he was buried in the Friend’s cemetery in Newtown .